With the proliferation of social media channels, how do marketers decide which channels to leverage to effectively reach customers and, within those channels, how to create content to drive behavior which aligns with business goals? Today billions of people use social media platforms, and as these numbers continue to rise, companies increasingly rely on social channels to effectively reach their audiences. In a recent survey, marketing executives reported spending a fifth of their marketing budget on social channels, and they anticipate increasing spend on these channels from 11 to 19 percent over the next five years. Yet even as their investment in social channels continues to grow, marketing executives report that a key challenge is understanding how to effectively use social media to positively impact company performance. One of the biggest challenges we face is creating the right content for the right channels. We've found that audience expectations vary from medium to medium, meaning that you need to tailor each piece of content to the specific needs of that channel. What drives engagement on Facebook won't evoke the same response on Twitter. Understanding those differences, and having a framework in place to address them, is crucial to achieving a high ROI on your social efforts. Through our research, we create such a framework to understand why consumers use social media, and from there, how to choose social channels best aligned with company goals and how to create effective content for those channels. 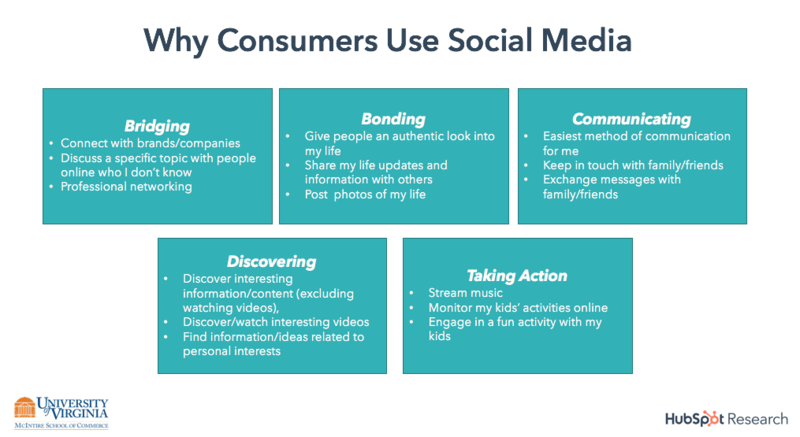 We surveyed 3,665 U.S. respondents and found that consumers’ motivations for using social media channels can be classified into five distinct categories: bridging, bonding, communicating, discovering, and taking action. 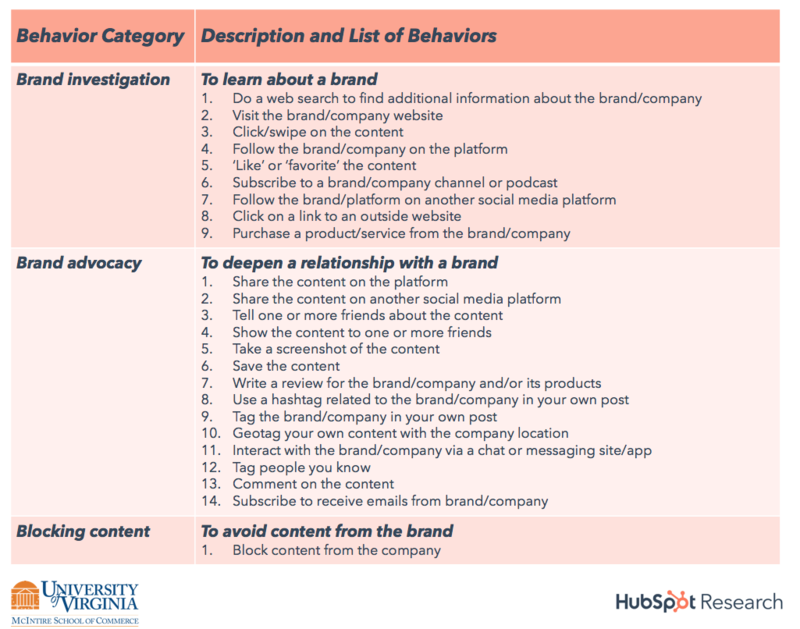 Furthermore, consumers’ behaviors when they encounter brands or branded content on social networks can be categorized into three types of actions: brand investigation, brand advocacy, and content blocking. We tested these behaviors on popular social networks to better understand the specific types of channel placement and content that drive consumers to respond. 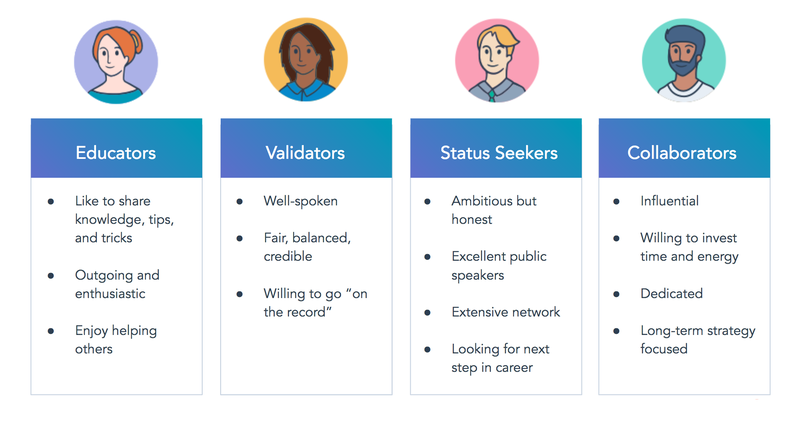 We also analyzed one year of campaign data from HubSpot across popular social media channels to validate our framework (See "Research Methodology" at the end of the report). With the resulting framework, marketers can predict customer response across channels and by content type prior to content distribution, allowing them to derive greater value from these platforms. More specifically, companies can choose the right channels and the right content to attain a particular performance objective - whether it is to expand their reach to their audience or facilitate organic one-to-one conversations with customers. People’s motivations to use each social platform vary and, in turn, drive different behavioral responses to brand content. 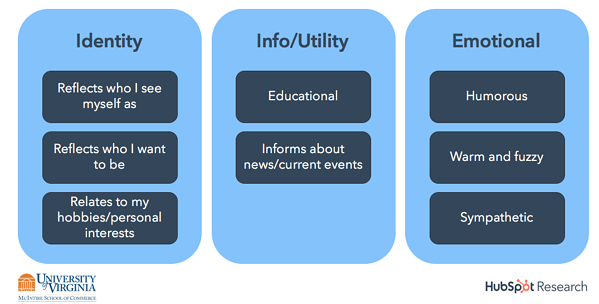 Through our research, we discovered 53 different reasons why consumers use social media platforms, which were distilled to five motivations using factor analysis – Bridging, Bonding, Communicating, Discovering, and Taking Action (see figure 1). Additionally, our analysis confirmed that the platforms differ from one another on how strongly each of the five motivation dimensions impacts consumers’ use of that platform (see figure 2). Facebook: Use Facebook to communicate on a one to many scale with your audience and invest in advertising to facilitate broader brand discovery. Pushing people to outside websites or landing pages is not advised. Facebook Messenger: Messaging applications are fairly new channels for marketers to leverage. Their use case is clear and brands can use Messenger to have personalized one on one conversations with their audience. Instagram: Users on Instagram primarily use the network to bond with their followers (by sharing details and images about their life) and discover new trends. Create broader content that incorporate lifestyle interests for Instagram. Snapchat: Snapchat is primarily used for bonding stories and for communication. Twitter: Users on Twitter want to discover new brands and content, and network with the brand, like-minded users, and other customers. YouTube: People flock to YouTube to discover new ideas, stories, and offerings. A series of regression analyses were used to determine the extent to which the motivation dimensions explain why consumers behave differently on each of the platforms. The findings show that the motivation dimensions do in fact drive varying behavior towards brand content. In addition, the analyses reveal differences in how the five motivation dimensions affect consumers’ behavioral responses to brand content. For example, when consumers use a platform for Bridging and Discovering, they are more likely to respond to brand content than when they use a platform for Taking Action or Bonding. Communicating actually reduces response to brand content. This results in some social channels performing better than others at facilitating specific types of behaviors (See “Choosing the Right Social Channels”). Furthermore, tailoring content to these motivation dimensions identified by platform enhances the behavioral response (See “Choosing the Right Content”). ● Overall, Twitter is the best social channel for facilitating brand investigation and brand advocacy behaviors, suggesting that companies should increase their investment on this social channel when their goal is to facilitate positive word-of-mouth, as well as encourage online search behaviors (e.g., website visits), and offline behaviors (e.g., purchase). Twitter offers advocates of your brand a platform to communicate with their audience, giving brands broader reach. On the flip side, they can turn to Twitter to voice their unhappiness if you disappoint them. ● Facebook also broadly performs well and is effective at encouraging consumers to communicate with a brand (e.g., direct messaging, viewing and liking content, providing email information) and to advocate on a brand’s behalf. Yet, consumers also exhibit a high propensity to block brand content, making it critical for companies to produce the right content for this channel. Blocking is not necessarily a behavior that must be avoided by brands -- having consumers self-select and remove themselves from a brand’s reach means the brand won’t waste resources marketing to people who aren’t interested in their product or services. The warning flags should fly if blocking behavior impedes a brand’s ability to reach anyone, because it is a signal that the content the brand created does not resonate with the intended audience. ● Instagram performs moderately well for brand investigation and brand advocacy behaviors and is particularly useful for companies that want to encourage consumers to share information about a specific company location (e.g., geotagging) to drive in-store traffic. The platform may also be a valuable complement to Twitter to further encourage website visits and purchase. ● Facebook Messenger results in the lowest performance for brand investigation behaviors, suggesting that companies should use Messenger to provide prompt responses to questions or one-to-one guidance when proactively asked by a consumer, rather than using the channel to drive brand awareness at the top of the funnel. ● YouTube results in the lowest performance for brand advocacy behaviors, suggesting that companies seeking to encourage existing customers to promote the brand should avoid this social channel in favor of other channels. ● Snapchat results in moderate performance for brand advocacy behaviors and the second to lowest performance (next to Facebook Messenger) for brand investigation behaviors. This suggests that companies seeking to provide more information to consumers to encourage website visits or purchase should avoid this channel in favor of other channels, but this channel may be a useful for companies who want to deepen their relationship with existing customers. 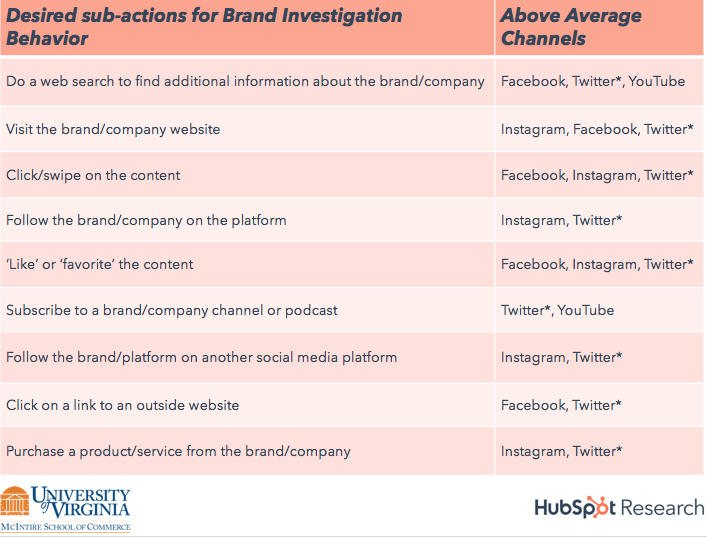 When we dig deeper on specific brand investigation and advocacy behaviors, there are different optimal channels for a company to choose, based on how the 24 behavioral responses align with desired performance metrics (see figure 5). In all, Twitter, Facebook, and increasingly, Instagram, produce above average behaviors in consumers, and should be integral to any company's social strategy. Twitter is strong in prompting people to conduct additional search on the brand, to click on posted content, visit the brand’s website, follow the brand, and like and favorite content. There’s also data showing that that this brand affinity manifests in a future purchase. 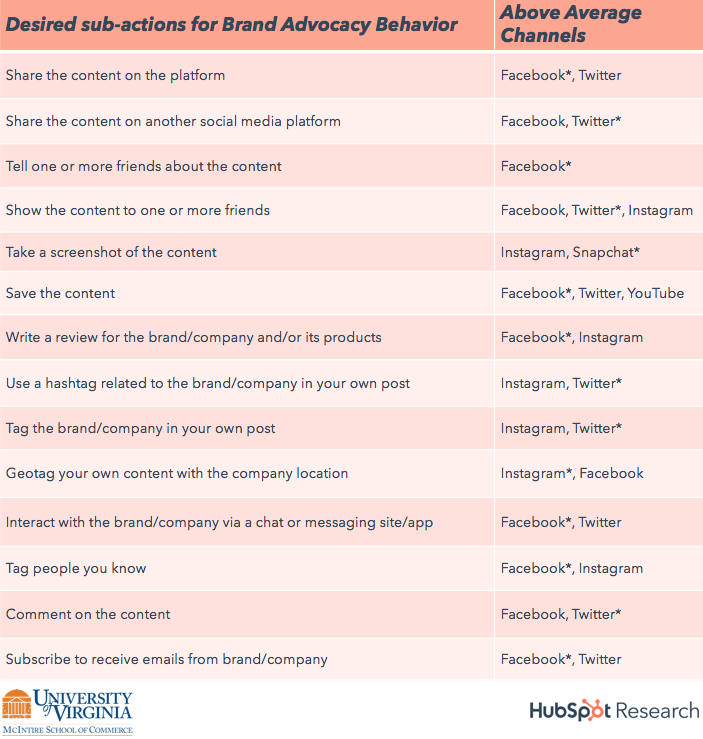 Brand advocacy behavior is a strength for Facebook and Instagram. Users are more likely to share content, tag friends to posts, talk about content, write a review, geotag, message with a brand, and write reviews. These advocacy actions from happy customers contribute to a flywheel effect that brings in more potential prospects for a brand. After identifying the right channel to post content, companies need to consider the type of content they are going to create for a chosen channel. Our research identified eight distinct categories of content (see figure 6). 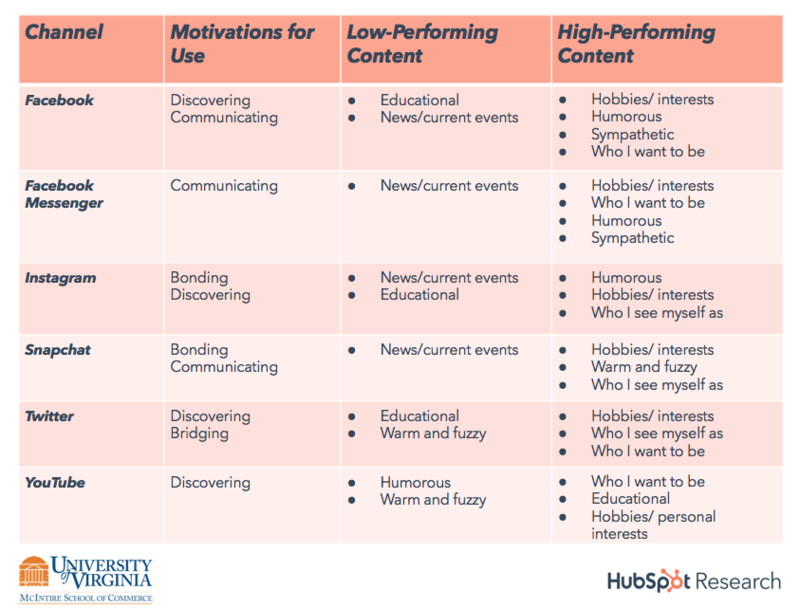 These content categories build on HubSpot’s existing framework in which content broadly reflects consumers’ identity (Identity content), provides information to consumers (Info/Utility content), and elicits an emotional response from consumers (Emotional content). A given piece of content may have characteristics of multiple categories, but may be more associated with one of the eight categories than others. ● Reflects who I see myself as – In the Always ‘Like a Girl’ video, a woman responds to the taunt “like a girl” by encouraging young girls to keep doing what they are doing and participating, while also shows shots of girls doing sports in a studio. A HubSpot video ‘Work-Life Balance’ relays the top five policies for companies to promote a good work-life balance and the benefits of doing so. ● Reflects who I want to be – In the ‘Passing Notes’ video for the Indigo Love of Reading Fund, a young boy is called out after passing a note to the girl next to him. The teacher reads the note aloud, revealing a love poem comprised of his innermost thoughts. HubSpot video ‘Entrepreneurship is Back’ focuses on the value of entrepreneurship, opportunities for entrepreneurs and the benefits of pursuing this career path. ● Relates to my hobbies/personal interests – ‘JARS’ by Dani Dessert uses a recipe-style video demonstrating different recipes for desserts that can be made in mason jars. The HubSpot ‘Chance the Rapper’ video shows the background story of Chance the Rapper who has developed an effective business model based on giving away his music for free. ● Educational – An ‘Introduction to Climate Change’ is comprised of an animated video with a voiceover explaining how greenhouse gases result in climate change, especially as a result of human activity, and uses graphs and numbers to further illustrate the impact of climate change. HubSpot’s ‘What is Artificial Intelligence?’ is a voiceover video which provides a definition of artificial intelligence in simple and understandable terms, as well as examples of everyday AI uses. ● Informs about news/current events - BBC ‘World News’ provides a one-minute recap on political news and current events in England. 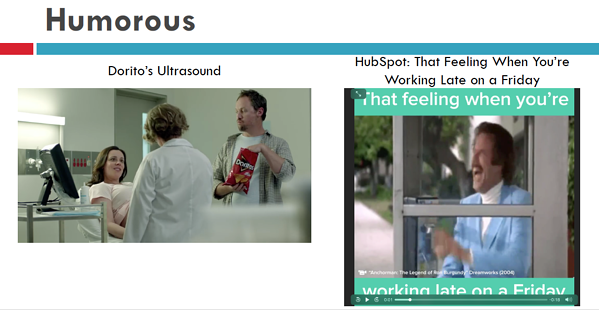 HubSpot’s ‘This Week in 3 Minutes’ reviews the biggest technology and pop culture news of the week. ● Warm and fuzzy – The video ‘Proposal’ by Extra Gum shows a marriage proposal. To the sound of romantic music, a woman walks through a gallery of doodled-on gum wrappers featuring the most important moments in her relationship with her boyfriend, with the last one showing a proposal. When she turns around, he proposes. 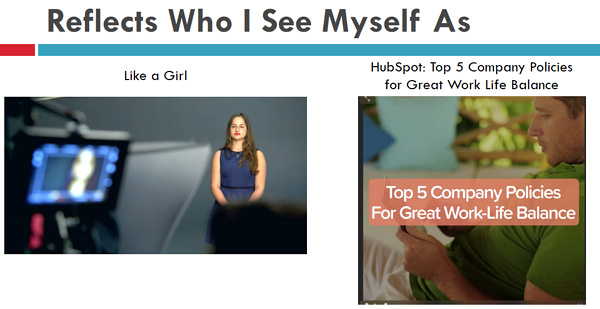 HubSpot’s video ‘Bring Your Dog to Work’ shows a girl’s French Bulldog sitting on her shoulders while she is working at her desk. ● Sympathetic – The ‘Animal Cruelty’ commercial for the ASPCA features videos of suffering animals and a sad song, intending to get viewers to donate to the humane society. The HubSpot video ‘What Buying Dog Toys Taught Me About Business’ features CEO Brian Halligan telling a touching personal story about buying toys for his dog and relates it to a business lesson about not always saying yes. To understand content performance by channel, we used surveys to test the same pieces of content (which reflect each of the eight identified content categories) across all platforms and validated the survey insights using in-market campaign performance for HubSpot content pieces. Survey findings show that people not only generally prefer different types of content as a function of their reasons for using a platform, but their behavioral response to brand content is driven by these various motivations. Integrating the survey results with the actual performance of campaigns in market, we are able to assess the relative effectiveness of content categories for each channel and suggest the optimal content for driving intended behaviors. Consistent results across the HubSpot survey and the HubSpot campaign data, as well as survey results for the content from various other organizations and product categories, allow us to broadly identify patterns of content category effectiveness for companies across channels (see figure 7). ● Facebook: Hobbies/interests performs better than all other content categories, whereas Info/Utility content (Educational, News/current events) results in the lowest performance, consistent with the Discovering and Communicating motivations. Emotional content results in a moderate/high behavioral response, with Sympathetic content most effective. o Survey Insights: Hobbies/interests (‘JARS’ and HubSpot ‘Chance the Rapper’) resulted in the strongest consumer response, followed by Sympathetic (ASPCA ‘Animal Cruelty’ and HubSpot ‘What Buying Dog Toys Taught Me About Business’). Educational (‘Climate Change’ and HubSpot ‘What is AI?’) and New/current events (BBC ‘World News’ and HubSpot ‘This Week in 3 Minutes’) consistently had the lowest effect on behavior. o In-Market Campaign Performance: HubSpot campaign data corroborated the survey insights, wherein Hobbies/interests (‘Chance the Rapper’) and Humorous content (‘That Feeling When You’re Working Late on Friday’) received 5.5X more engaged users than Who I want to be (‘Entrepreneurship is Back’) and 10X more engaged users than New/current events (‘This Week in 3 Minutes’). ● Facebook Messenger: Identity (Hobbies/interests, Who I want to be) and Emotional content (Humorous, Sympathetic) performs the best, whereas News/current events performs the worst, consistent with the Communicating motivation. o Survey Insights: Humorous (Doritos ‘Ultrasound’), Sympathetic (ASPCA ‘Animal Cruelty’), Hobbies/interests (‘JARS’), and Who I want to be (Indigo ‘Passing Notes’) resulted in the highest behavioral response, while New/current events (BBC ‘World News’) resulted in the lowest response. ● Instagram: Emotional (Humorous, Warm and fuzzy) and Identity content (Hobbies/interests, Who I see myself as) performs better than Info/Utility content (Educational, News/current events), consistent with the Bonding and Discovering motivations. o Survey Insights: Who I see myself as (Always’ ‘Like a Girl’), Humorous (Doritos ‘Ultrasound’), and Warm and fuzzy content (Extra Gum ‘Proposal’) resulted in the highest behavioral response, while News/current events (BBC ‘World News’) and Educational content (‘Climate Change’) resulted in the lowest response. o In-Market Campaign Performance: Warm and fuzzy content (‘Bring Your Dog to Work’) received 2X more likes and 2X higher engagement rate than Educational content (‘February Social Media Roundup’). ● Snapchat: Warm and fuzzy, Hobbies/interests, and Who I see myself as content performs the best, whereas News/current events content performs the worst, consistent with the Bonding and Communicating motivations. o Survey Insights: Warm and fuzzy (Extra Gum ‘Proposal’), Who I see myself as (Always ‘Like a Girl’), and Hobbies/interests content (‘JARS’) resulted in the highest behavioral response, while News/current events content (BBC ‘World News’) resulted in the lowest response. ● Twitter: Identity (Hobbies/interests, Who I see myself as, Who I want to be) content performs the best, whereas Educational and Warm and fuzzy content performed the worst, consistent with the Discovering and Bridging motivations. o Survey Insights: Who I want to be (Indigo ‘Passing Notes’), Who I see myself as (Always ‘Like a Girl’), Hobbies/interests content (‘JARS’) resulted in the highest behavioral response, while Educational (‘Climate Change’) and Warm and fuzzy content (Extra Gum ‘Proposal’) resulted in the lowest response. o In-Market Campaign Performance: Hobbies/interests content (‘The Top 10 Movies Every Marketer Should See’), garnered a 2X higher engagement rate than Educational content (‘Take Your SEO Strategy to the Next Level’). ● YouTube: Educational and Identity content (Hobbies/interest, Who I want to be) perform the best, whereas Emotional content (Humorous, Warm and fuzzy) performs the worst, consistent with the Discovering motivation. o Survey Insights: Educational (‘Climate Change’), Hobbies/interests (‘JARS’), and Who I want to be content (Indigo ‘Passing Notes’) resulted in a higher behavioral response than Humorous (Doritos ‘Ultrasound’) and Warm and fuzzy content (Extra Gum ‘Proposal’). o In-Market Campaign Performance: More Educational content (‘What is AI?’), received 80X more likes and 200X more views than less Educational content (‘Netflix Didn’t Kill Blockbuster, Blockbuster Did’). Social media marketing continues to evolve, as marketers seek to optimize their marketing spend on social channels. Overall, our research suggests that by understanding the motivations for why consumers use each social media platform, companies can predict the types of behavioral responses consumers are likely to take on a given platform. This allows marketers to choose platforms aligned with business objectives and KPIs and create content to drive desired behaviors. Furthermore, as new channels arise, developing an understanding of consumers’ reasons for using the platform allows marketers to anticipate behavior and content effectiveness and, subsequently, maximize the value obtained from these channels, before allocating marketing budget. Across ten surveys, we asked respondents about their motivations for using social media platforms, the behaviors they perform when they see content from brands/companies on a given platform, and their content preferences by platform. 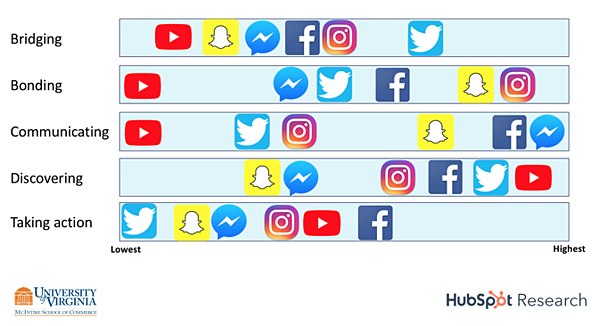 We focused specifically on the six social media channels most widely used by companies3 – Facebook, Facebook Messenger, Instagram, Snapchat, Twitter, and YouTube. For each channel, we surveyed only those respondents that used the platform within the last week. Survey respondents listed all of the reasons for using a particular platform. Conversations with marketers and additional survey research were used to develop a comprehensive list of the behaviors that consumers may take in response to viewing a piece of content. Subsequently, respondents were randomly assigned to evaluate a platform to develop a baseline of consumer behaviors and determine content preferences by platform. In the successive surveys, we explored effectiveness of brand content to determine which content categories drive behavioral responses. Respondents evaluated and classified 70 different pieces of video content (40 pieces of HubSpot content and 30 pieces of content from various other brands) and indicated their behavioral responses to the content by platform. To validate the survey results, we analyzed actual campaign performance data for HubSpot content pieces that were previously in market across a subset of the platforms (Facebook, Instagram, Twitter, and YouTube). The campaign data included key performance metrics available on each platform including clicks, views, shares, comments, and likes. 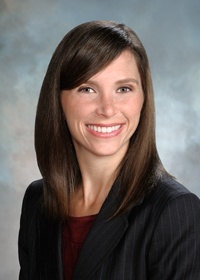 Nicole Votolato Montgomery is the C. Coleman McGehee Professor of Commerce and Associate Professor of Marketing at the McIntire School of Commerce at the University of Virginia. Professor Montgomery's research focuses on issues related to consumer behavior and judgment and decision making. In particular, she studies consumer memory and how consumers evaluate experiences over time. Her research also examines consumer commitment to brands and the effects of imagery in advertisements on consumer behavior. She recently began investigating issues related to financial literacy and decision making.